1. To activate the Romance Luck for those born with "Yin Metal" element in their day pillar according to the bazi chart. 2. To activate the Tao Hua Love Luck for those born under zodiacs rat, dragon and monkey according to the lunar calendar. 3. To activate career luck for those born under zodiacs Ox and Snake. The Rooster is the ally of those whose zodiacs are Ox and Snake. It will therefore help them achieve maximum results in their undertakings and career. 4. To help the Dragon. The Rooster is the secret friend of zodiac Dragon. It will help you through challenges, protect you against harm and provide you with great strength for persistency. It brings you good luck and promises a smoothriding path ahead. 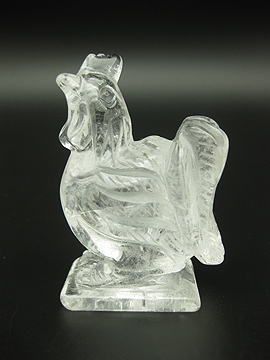 Figurines carved in clear quartz is extremely rare because clear quartz is expensive due to its potency in energy. What Rooster symbolizes and how to place the object? Traditionally, the rooster brings good fortune and joyful events in Feng Shui. Rooster counters poison, kill worms and is the only animal that is able to eat centipede. Although it is not a bird of threat, but it is its character that made it useful in feng shui. It has a strong, abled, confident and protective character. It is also the only animal that acts naturally like an alarm clock when the sunrise in the morning by waking people up from their beds to start off in the imperial courts, morning markets and paddy fields. 6. preventing third party love affairs. 3rd party are known as the centipede, therefore the rooster is able to watch against it. 7. boosting recognition luck because the rooster is linked to the kingdom of winged creatures in charged by the fiery Phoenix. 1. To activate Tao Hua Love Luck for singles (those born under zodiacs rat, dragon and monkey) who are seeking relationship and marriage luck, display this figurine in the west of your bedroom, west quarter of your house, west of your living room and even west sector of your workdesk. 2. Rooster will help to solve political problems in office, backstabbing, arguments and harmful peers when placed on your office desk. For modern offices that have cubicles that resemble a centipede arrangement, place the rooster on the boss' desk to kill the centipede that causes quarreling, havoc and irritation in office. 3. For businessmen, it is best to get a rooster facing outwards at the main entrance to ensure your competitors are kept at bay. The powerful rooster will help you counter attack their poisonous threat. 4. For married couples, you should be proud if your spouses are attractive. But you should also cautiously prevent centipede third party from affecting your relationship. Place a white or golden rooster facing outwards at the maindoor to prevent your spouse from being snatched away. 5. 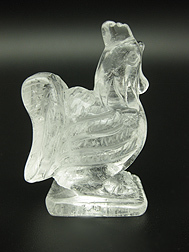 For those seeking for fame luck, you may place a proud rooster at the south corner of your living room or at your business premise to increase recognition luck. 6. For neighbourhood and apartments that has problematic centipede piping, roads or drain, the rooster is definitely a must at the dining area. 7. For kids that is suffering from worms in the stomach, it is best to place the rooster in their bedroom. 8.The Rooster will also be able to patch up a missing corner in the W2 (262.5-277.5 degrees). If ones home, premises or office has a missing corner there, they can display the figurine of the Rooster anywhere close to the vicinity of the missing corner there. The Rooster's position is in the W2 (262.5-277.5 degrees). Note: The Crystals offered by Feng Shui Bestbuy is cleansed by the singing bowl prior to customer shipment, to ensure refreshment of good chi when they reach you. Also note that natural crystals from earth may have uneven textures and colors, natural inclusions or original internal lines/cracks in them which may extend to the surface. These are by no means flaws or damages. They are absolutely fine from a feng shui perspective and will not make natural crystals less perfect compared to manmade items.